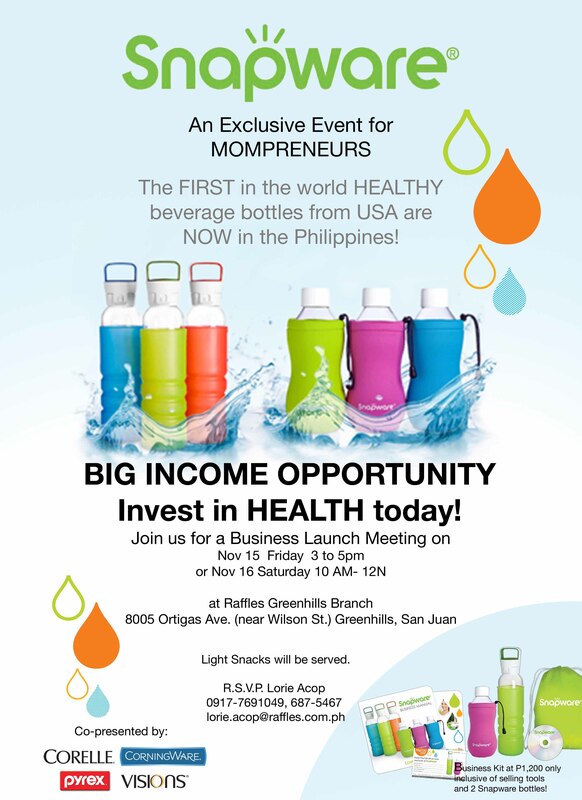 Snapware, the first in the world healthy beverages bottles, invites mompreneurs to an exclusive Business Launch Meeting on November 15, Friday from 3-5pm or on November 16, Saturday from 10am-12nn at Raffles Greenhills Branch, 8005 Ortigas Ave. (near Wilson St.) Greenhills, San Juan. Interested parties may RSVP to Ms. Lorie Acop at lorie.acop@raffles.com.ph. Hi!Where can i buy snapware flip bottles? Thank you..